Grilling out is one of the many joys of the summer. First, when you use a gas grill, you don't have to heat up your kitchen – which causes the whole house to heat up. Second, you get that special taste that you can only get from the direct heat of a flame. Third, grilling out is a great way to entertain and socialize – from planned parties to impromtu gatherings of neighbors. All you need is quality food and a great gas grill. I often use the terms “barbequing” and “grilling” as synonyms, but, in fact, they are not the same thing. The differences are in the type of heat and the cooking time. Grilling is done with direct heat, that is moderately hot to hot. The food is cooked quickly. This is the method you are using if you are cooking a burger or a steak on your grill. Barbecuing, on the other hand, is done by indirect heat, often with smoke, and the food is cooked for a long time. If you are cooking ribs, or a whole hog, then you are barbequing. Of course, there are regional variations for what each of these terms mean. In Britain, for example, the term barbecuing means the fast cooking process over high heat. And grilling in the U.K. is what folks in the U.S. call broiling. Sometimes, people use the terms barbequeing and smoking as synonyms. Even the spelling of barbecue is up for debate – barbecue, barbeque, bbq, barbie – are all variations. One of the inventions that made grilling so ubiquitous was the Weber grill, which was invented in 1952 by George Stephen, Jr. By creating a cover for the grill, the food and flame were protected from the elements. Plus, the cover sealed in the heat and the smoke, which allows the food to cook evenly while soaking up that great smoky flavor. 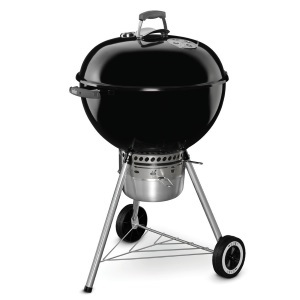 Nowadays, grills range from very simple devices to complex cooking technology. I remember the cast iron hibachi that my family used to use. It was low to the ground and used charcol briquettes. You can still use charcol, or you can use propane or even natural gas. I think that having a grill where the cooking surface is elevated to waist height is the way to go. You can purchase a grill on a stand, or set a smaller model onto a fire-proof tabletop. The most imporant aspect of a grill is that it is sturdy. You don't want it to tip over. So, give the grill a nudge from several different angles. It should remain solidly in place. With safety in mind, also check out the handle. You want enough room between the handle and the lid so that your knuckles and fingers don't get burned. Gas grill options are abundant. The main cooking surface is for burgers, hot dogs, and steaks. If you are planning to slow cook a chicken, then you will want a rotisserie burner. Side burners are excellent to use for keeping foods warm or slow cooking a side dish. Another option to look for is an infrared burner. This technology uses heated surfaces to radiate the heat to the food. While cooking with infrared burners takes some practice, Consumer Reports found that 63% of people who had grills with infrared burners used them regularly. So, once you have chosen your gas grill, stock up on some long-handled grill tools, break out your favorite foods, call up some friends, and let the party begin! If you think that birds only need to be fed in the winter, then you are part of the majority of people who think so. Unfortunately, that is just not the case. While birds certainly do benefit from feeding during the winter when natural sources of food can be scarce, they can benefit from human-supplied food nearly year round. There are various reasons for this. In the early springtime, for example, migratory birds have just returned from their long flights, and they are hungry and in need of good nourishment. At that time of the year, the trees are bare and the grasses have not begun to grow. So, until the spring foliage is fully developed, there is a limited supply of food, and there is fierce competition for what little food that exists at that time of the year. 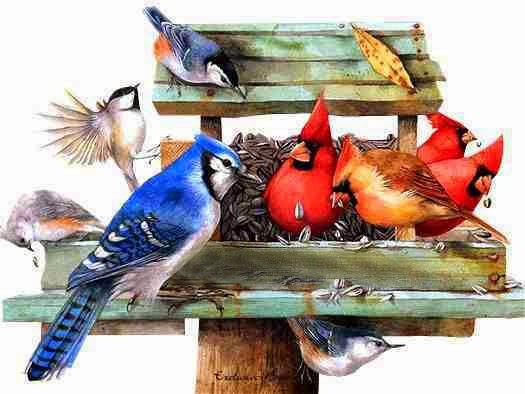 The early springtime is also the time of the year when birds build nests. These nest building activities put extra stress on birds' bodies, and so the birds can benefit from extra sources of human-supplied food. In fact, many experts advise that you leave your bird feeders up until after the time that the leaves on the trees are fully grown in and developed. After spring comes summer. During this season, hummingbirds and orioles appreciate nectar feeders. Hummingbirds need lots of carbohydrates to thrive. As summer comes to a close, the migratory birds need to fatten themselves up in order to survive their long flights to warmer climates. Finally, in the fall and winter, the non-migratory birds need to be fed. 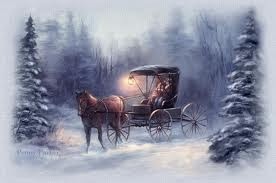 This is especially true if there is snow and ice covering the ground, which covers up the natural food supplies. 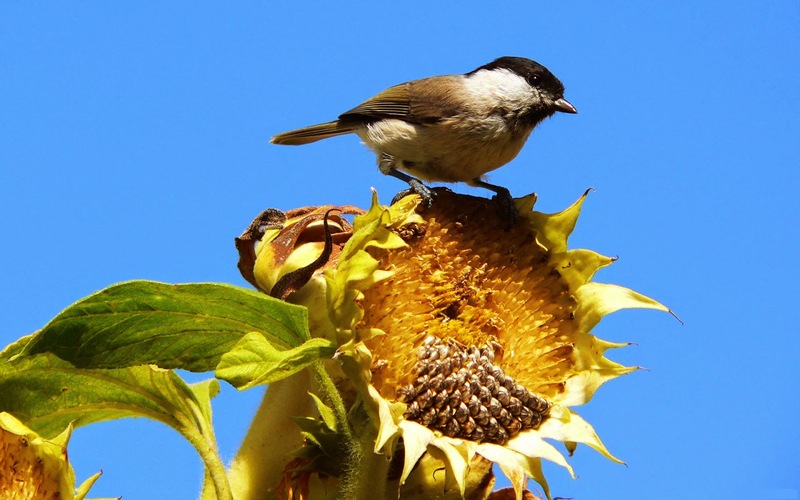 As for the question of what to feed birds, they thrive on diets that are different than ours. They need to eat high amounts of fat and protein. In fact, if you put out nothing else, feed the birds black oil sunflower seeds. These are an excellent choice because they are economical and provide excellent nutrition. Because they appeal to the widest variety of birds, there will be no waste. You should be cautious of commercial mixes, because they are often full of unpopular seeds. These are a waste because the birds will not eat them, and you will have paid money for seeds that will be left at your feeder and on the ground where they will attract squirrels and other less desirable rodents. Some examples on undesirable seeds are flax, golden millet, buckwheat, red millet, and rapeseed. In addition, to these, canary food, wheat, and oats are only consumed by nuisance birds. Read the ingredients on any bag of commercial mix that you are considering. If you see any of these seeds, then steer clear. Here are five facts that we have recently compiled about wild birds. We thought these were interesting, and we hope that you do too. All mockingbirds have a unique repertoire. No two mockingbirds ever sound alike. You can see a mockingbird perch on a very high tree or on a telephone pole and sing its heart out. It mimics the sounds that it hears in its environment: other bird songs, frogs, cat meows, dog barks, even squeaky hinges. Scientists believe that each mockingbird can have a repertoire that contains over 200 songs. Birdbaths aren't just yard decorations. Rather. they serve an important purpose. Birds love shallow water. Most importantly, birds need water to drink. They also like shallow ponds to bathe. "Shallow" is key, however, because songbirds cannot swim. 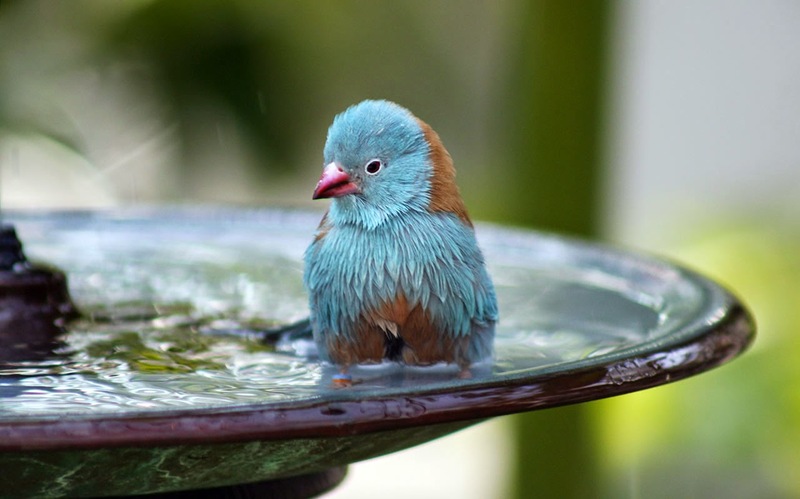 You can set a proper birdbath for them your yard, or even create an in-ground shallow pool in your yard. Most people opt for birdbaths on some sort of pedestal or one that hangs. They are easy to maintain, and the birds aren't as vulnerable to predators as they would be if they were on the ground. It is important that you keep your bird bath clean. You should clean it by scrubbing it with a 1:1 vinegar to water mixture about once a week. And remember that birds also need water in the winter. You can get a heated bird bath to provide them with water in that season. Feather and skin treatment – all from dust! Birds clean themselves frequently, and not just with water. They also take dust baths to keep themselves clean. 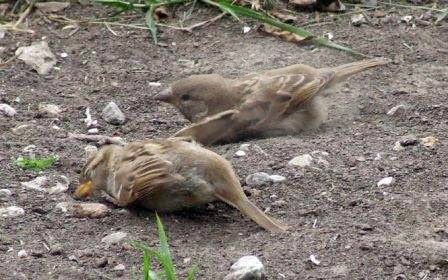 There are quite a few species of bird that will find some ground that is full of dust and then cover themselves in it. They roll around, and generally brew up a dust storm. Dust baths are always followed with cleaning their feathers, also known as preening. Thus, the experts think that dust baths help keep birds' feathers clean when there is no water available; and the dust baths may soothe irritation that is caused by molting or mites. Birds need a place to hide. Birds may hunt in the open, but they love cover. You can help them out by providing some on your property, especially in the winter. Any sort of evergreen, trees, or bushes will be valued. During the cold months of January and February, you might even want to prop up your used Christmas tree outside for a few months for the birds to hide in. A thicket or a brush pile in your yard also makes an excellent place for birds to rest in safety. Are you feeding birds or....? 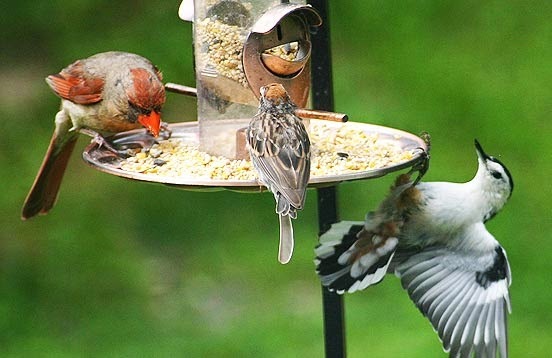 You may find that your bird feeders are emptying much more quickly than usual. You may enjoy feeding the local wildlife, but it is usually better not too. It makes them less afraid of humans. Now, squirrels are clever animals. If your bird food is disappearing quickly, they are often the culprits. If it can be done, they will find a way to get to the food that you put out for the birds. Some of the devices available to deter squirrels are squirrel baffles, caged feeders, twirling feeders, and all sorts of other contraptions. Some work better than others. But in the end, you may just have to accept the fact that the squirrels are very acrobatic and clever. 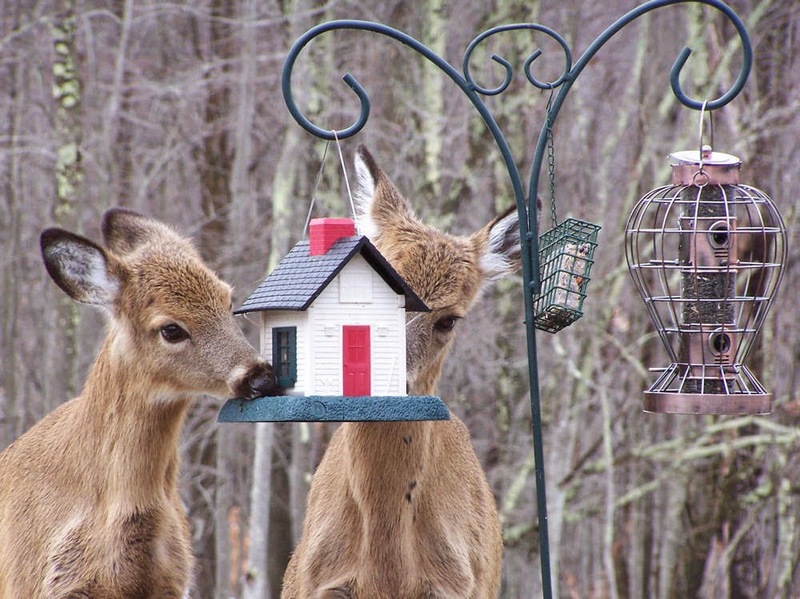 You may even want to get a peanut feeder just for them. Simply Love Gardening is now redesigned! With our customers in mind, we have updated and increased the selection of the best outdoor items available. Most of the products on our site feature free shipping and a 30 day money back guarantee! Please visit us and let us know what you think! The forsythia’s and the pear trees are in bloom here in the Piedmont of North Carolina. We had a beautiful weekend in the 60 and 70 degree range and spent a lot of time working in the yard. The flower beds are getting cleaned up and compost is being added. We will add some dark mulch in a few weeks. It’s time to start planning for the backyard raised gardens. - Plants can be placed closer together, because there is no need to allow room to step between. - There is higher production in a smaller area. - Less water, compost and fertilizer are needed in a targeted controlled area. - Raised beds tend to drain well. We have found that gardens for all seasons are more achievable using raised beds. Farmer’s Almanac has great raised garden bed ideas at http://www.almanac.com/content/garden-raised-beds-and-small-plots. We woke up to a winter morning in Denver, NC (17 Degrees)! Simply Love Gardening is a family owned business based in North Carolina. We are passionate gardeners that love to go to garden shows and nurseries in search of unique, quality products that will beautify the yard, garden and outdoor living experience. We carry a great selection of products including planters, hammocks, garden tools, fountains, pergolas, and much more. At Simply Love Gardening, we take pride in giving you a broad selection of top quality products for your yard and garden. Our goal is to provide our customers with long-term value and product satisfaction with every purchase.